Thanks to Roger, VE3ZI, for his big help in getting this to work! I am not an expert at this stuff, but I did do battle with it, and thanks to VE3ZI (and meaningful comments from others), I got it working. I’ve used Writelog for my modest contest logging for a while, and really like it. However, when I installed the new RigBlaster Pro, Writelog kept causing the PTT and CW lights to be stuck on on the RigBlaster, which of course made the IC-746PRO get stuck in xmit. From the rig interfacing part of the help file: ‘Writelog asserts RTS/DTR unless that port has also been selected for CW and PTT‘ (paraphrased). WL HAS to work that way so that port-powered radio interface units will get powered by the port. My experiments showed that here, at least, it also works as planned when ‘PC generates CW’ is selected on the SAME PORT as the rig control. In that case RTS/DTR are set low UNLESS WL wants to assert PTT or CW send, and that is what actually happens for me. Don’t forget to save Setup else it will change back when you reload WL. NOTE: the Baud Rate for COM1 is set to 9600, which matches the speed set in the 746 MENU # 36 (CI-V Baud Rate). I do NOT suggest setting the Baud at AUTO (either in software or in the rig ) — it might or might not work. 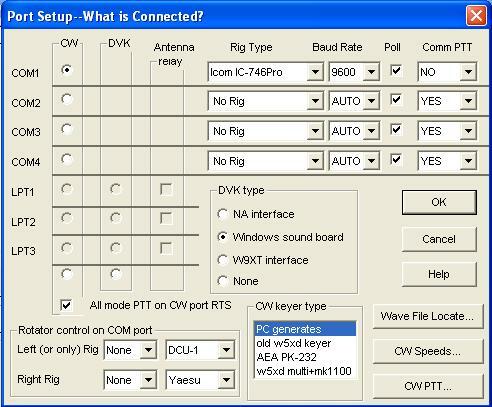 These settings work for SSB, CW, and RTTY. The MMTTY RTTY plug-in for Writelog is really neat — details can be found on AA5AU’s web site, and/or rttycontesting.com . 2011 Addendum: I added a 2nd radio, a Kenwood TS-480, as Radio #2 in Writelog (on Com6), and a rotor control card (Idiom Press) for my Yaesu G-1000DXA rotor (on Com5). 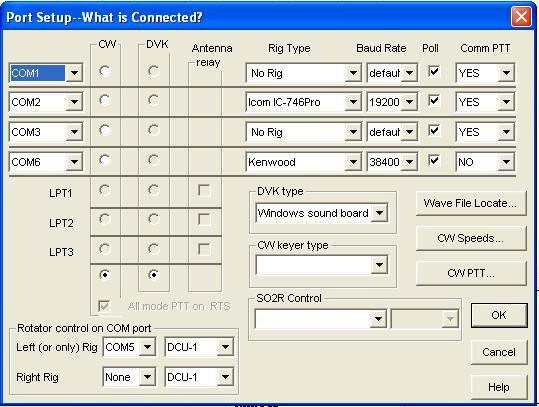 This is what the Setup/Ports screen looks like now (WL 10.82A). Note: Comm PTT for Kenwood MUST BE = NO — otherwise, RTTY (in Writelog’s MMTTY plug-in) won’t xmit properly.